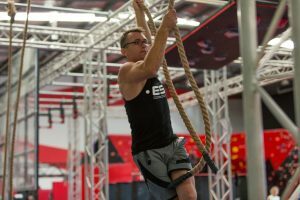 After a few frantic days of training before the big event, almost a dozen ninja visitors, along with 17 locals descended on Ninja Academy in Perth for the much-anticipated Ninja Challenge League: Interstate Qualifier II on Saturday, September 9. The premise was simple, to earn a spot in the NCL Finals 2017, the interstate guests had to either place in the top five for their gender or simply complete the course laid out just over a month earlier online. This meant that there were a minimum of eight ninjas guaranteed a spot going into the day (the top five men and the three women competing) but if they held their nerve – and grip! – then all 11 could book a spot in the Finals with a finish. After having the rules explained by the Commissioner, the run order announced and the group photo taken, it was straight into the action with Ken Elias, who was due to fly out in a few hours, going up first. A veteran of the Ninja Challenge Finals in 2016, the so-called Ninja Therapist’s experience held him in good stead as his slow and steady approach saw him finish the course at a stately pace of 3:49:69, to the delight of the watching crowd and his training partners in particular. 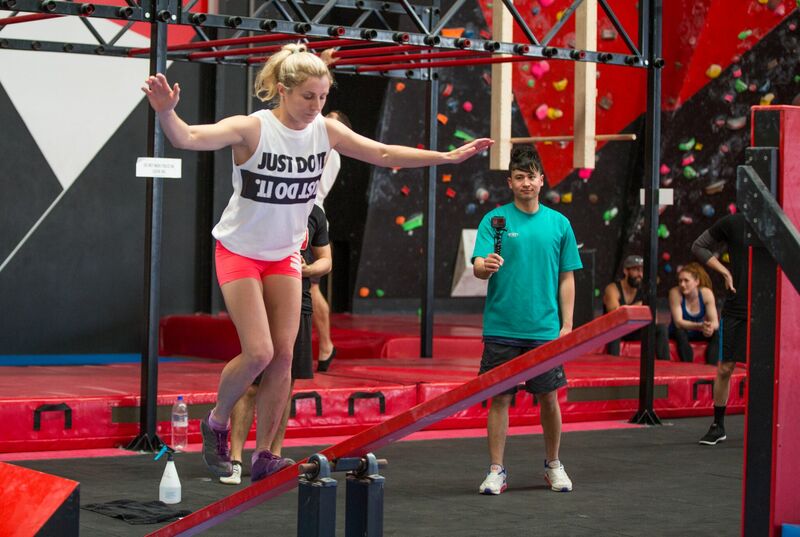 Soon afterwards, Australian Ninja Warrior competitor Nat Deegan hit the course as the first female challenge. Nat looked smooth through the first few obstacles and despite some difficulty with the Peg Board, managed to clear the fourth obstacle too. 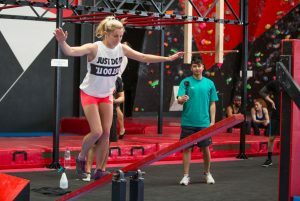 She lost her balance on the Limbo Rail and sat back on the starting platform, an entirely legal move, but unfortunately she had misunderstood the rules and jumped off the rail and ending her run, mistakenly expecting a disqualification was imminent. Following immediately after Nat was the second female competitor and an Australian Ninja Warrior semi-finalist, Betsy Burnett aka the Disco Ninja. Like Nat, Betsy also made short work of the Tilting Path, Spider Walk and Rope Jungle, but while Deegan had used the “monkey” technique on the Peg Board, the Disco Ninja opted on the bent arm variation and ultimately ran out of gas before she could reach the safety of the finishing platform. The second male interstater was calisthenics athlete James Felsch, who looked strong through the pegboard, but unfortunately came unstuck on the Limbo Rail and faced a nervous wait to see if his efforts would be enough for a top five finish. 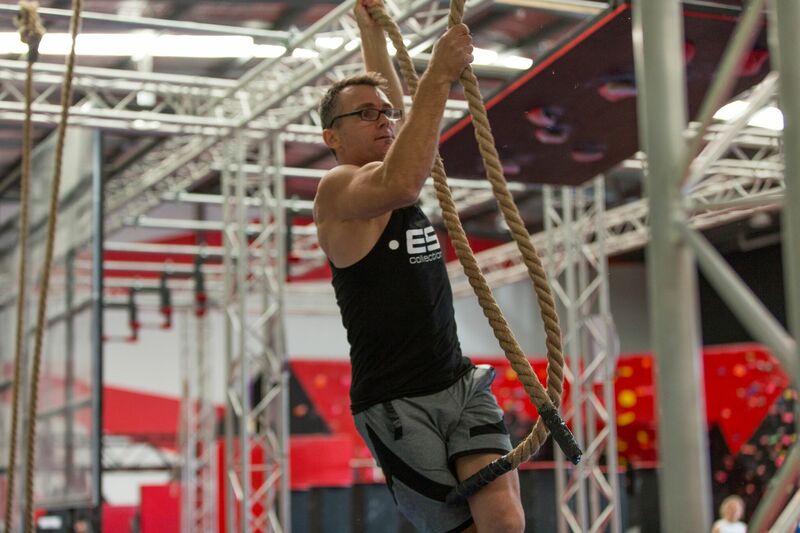 The locals took over at this point, with a host of Perth ninjas demolishing the course, but there was no question who would post the best time, with reigning number one seed Josh McMurray putting up an astounding time of just over 57 seconds, clearing the next closest time by more than 20 seconds. 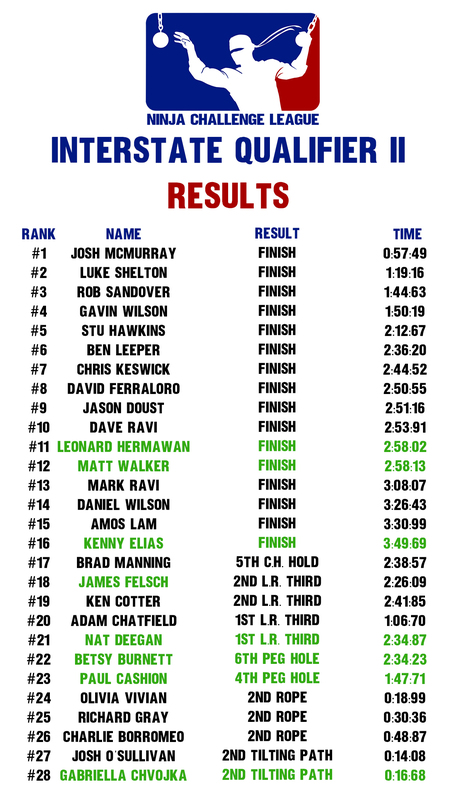 After a lengthy run of locals, Charlie Borromeo, Richard Gray and Josh O’Sullivan all ran close together, but unfortunately both Richard and Josh made costly mistakes on obstacles and Charlie was disqualified for a rules violation on the Rope Jungle. With only Matt Walker, Leonard Hermawan and Paul Cashion left, whether any of the non-finishers got through was going to be a close call. 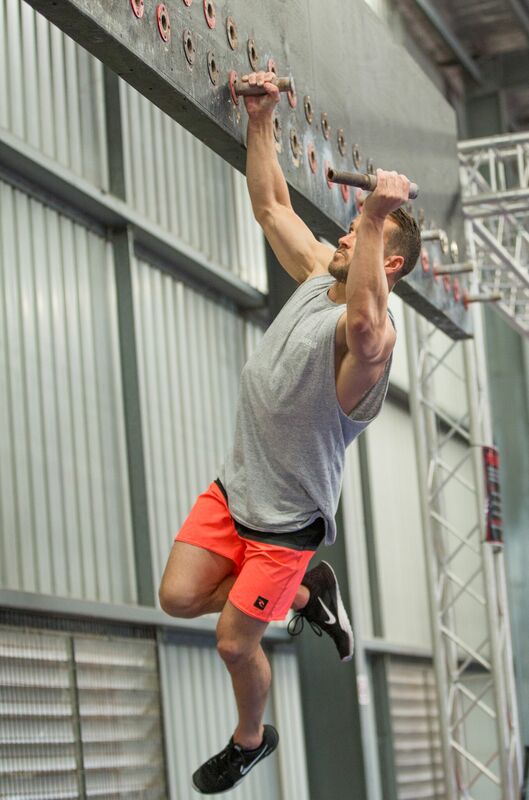 Matt Walker, the older of the two Walker brothers and one of the many victims of the Bom Slider on Australian Ninja Warrior last season was the first of the group to run and crushed the first four obstacles. But as he prepared to take on the Limbo Rail, he needed a moment to steady his nerves. 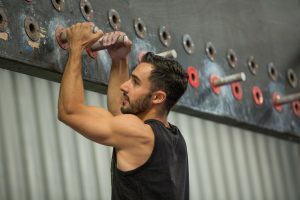 Despite his experience on slacklines, Walker confessed that he struggled on rails and his apprehension showed as he took on the obstacle, but despite a close call requiring a leap of faith at the end, he was able to clear the final balance obstacle and use his tremendous upper body strength to destroy the rest of the course in under three minutes, beating out times put up by several local finishers. The next of the group, Leonard “Lion” Hermawan was one of the few people who returned for another chance at qualifying after failing to secure a spot in the first Interstate Qualifier in June when he was defeated by the Cliffhanger. 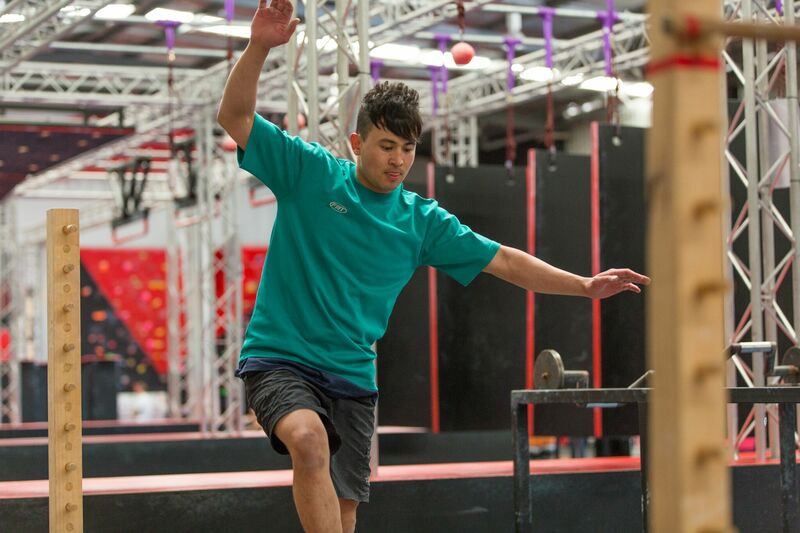 What a difference a few months made as Leonard looked supremely confident as he tackled the course and showed off the results of his hard work in preparation for this comp by posting the fastest time for the Interstate visitors and more than securing a spot in the Finals. 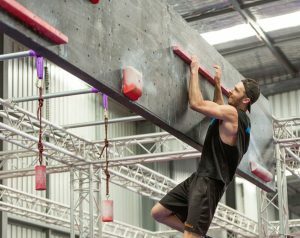 As one of the last runners, the pressure was on Paul Cashion, another Australian Ninja Warrior veteran, to at least reach the Peg Board to secure his spot in the Finals. 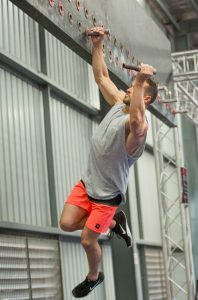 Having been disqualified on the show, it was with bated breath that the crowd watched Cashion take on the course and the relief was audible as he passed through the Rope Jungle where several competitors had already been disqualified that day. After an epic save on the metal pegs, Paul recovered to move a few extra places along the pegs but was ultimately unable to complete the obstacle and fell to the mat. While all entered the day with hopes of securing a spot in the Finals, only eight visiting ninjas were able to do so, with the overall standings are presented below. The names in green are the ninjas who successfully earned a spot in the Finals. 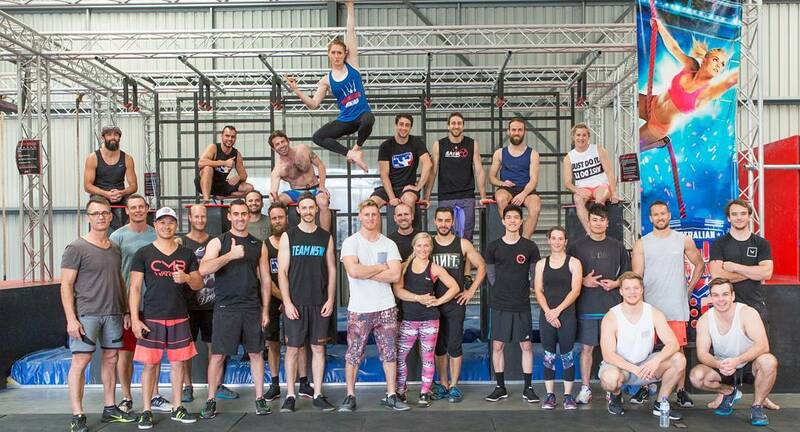 A huge thanks from the Ninja Challenge League to the locals and visitors alike for making this an amazing day and for Ninja Academy for hosting the event. → Ninjas In Training : The Ninja Babes!